"The performance runs from April 12 to 14 at SEI Innovation Studios, and finds Stuckey accompanied by steel guitar and gurgling 80s-ish synths, discovering a hole in her heart and her past that runs along the sweat-filled lines of a modern day James Cain or Erica Jong…an unnerving sensualist place where easy escape seems unlikely. " ALAINA MABASO FOR BROAD STREET REVIEW on due to the sensitive nature: "Fortunately for Philly audiences who love Martha Stuckey, she didn’t listen when an old boyfriend demanded that she stop singing." "The whole performance felt like when the Blue Angels get into formation at high speeds, and then flip simultaneously, and ALMOST touch wings and kill each other. And then you realize that it’s all by design, and that the tension is the reason it’s fun." 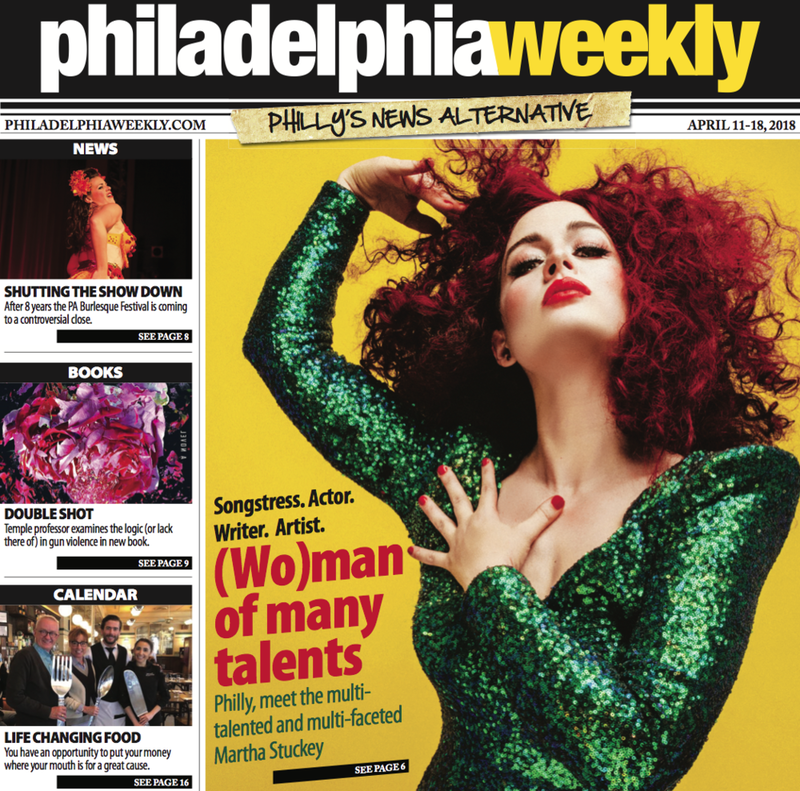 Cover of Philly Weekly - check! She’s complexity in a costume. "She's complexity in a costume." "A visual storyteller of femininity and all that comes along with it." "To be Martha Stuckey, is to be a wearer of many hats under the sphere of music and theater." "We Coulda Been" on NPR!! Growing up on NPR music, I'd never dreamed I'd be on it!